Hello and welcome to episode six of the My Open Kitchen podcast! Honestly we are so excited to be back again with another great episode full of inspiration, great ideas and cool people to follow up with. We love bringing you these stories from behind the farm gate and hopefully inspiring you to open your own doors, invite the world into your kitchen, and share all the things we love about country living. This episode features Sophie and Skye’s top five (some fantastic links in there, check them out below), some great things to cook plus an interview with this lovely lady (above); Venetian based food writer Skye McAlpine and guys – it’s a doozy! Skye shares so many great ideas, insights and inspiration in this interview, all about cooking, blogging, photography, growing an online community and of course, what it’s like to live in arguably one of the world’s most beautiful cities (lucky lucky lady). You can see more of Skye’s work on her beautiful blog From My Dining Table and Instagram where she shares beautifully styled images, stories and insights into Venice as a living breathing city not just the world’s most visited destination. Who doesn’t love a lamington right? Well this week Skye brought in morning tea, a lovely big tray of them, freshly baked by her clever husband Damien (nice work!). They were so good, we forgot to take a photo before tucking in and dividing up the leftovers for our kids’ lunchboxes. Sorry guys. Damien used a Donna Hay recipe for this lot – there is no doubt about her cooking, it’s always simple and easy to follow and produces yummy results! It’s a great start for boys who are getting into baking – Go-on do it boys!!! You can find the recipe by clicking here. 1.Adagio by Trish Dickson and taking time to walk to the mailbox! This book has been a real inspiration for me, in a sense that it makes me take hold and appreciate ‘slow’. The end of the year is always very busy for my family, especially now. I find myself thinking a lot about this book a lot, especially Trish’s words about taking great joy in the simple, and that it’s alright if a 2km walk to the mailbox is the biggest achievement of the day! It’s a book all mum’s would love, it’s about gardening, family, music and food. I yearn for it every time I visit home and it’s for that reason that I don’t actually have a copy, I keep it for when I am away and it forces me to ‘slow’ to take time to re-read it. 2. Five Mary’s Farm, a cattle, chicken and pig Ranch at Sharp’s Gulch in California. An absolute MUST. They are full package. A beautiful blog encapsulating, hearty country cooking, enviable country life. Five Mary’s are are value adders that work on a ranch that’s been in their family for generations.It’s just so idyllic, it’s the life I want to lead, it’s a beautiful depiction of genuine life on the farm, grubby clothes and all. The name originates from the four gorgeous girls in the family, who are all called Mary! This is a lovely short film of what they do. Secretly it almost brought me to tears! 3.North Wild Kitchen. A blog and a IG account from a mountain farm, deep in the belly of Norway. It speaks the same language as us; creating community through food, regional cooking and produce. Doesn’t have big IG following, so I really feel like I have ‘discovered’ it, which of course I haven’t as it was just announced as the winner of the 2016 Saveur Blog of the Year. I have read through the blogs of most of the winners, this one is definitely a the stand-out. 4. Local Gatherings. Because it’s spring and our farms/gardens/local parks are such inviting places to share with others right now. Local gatherings is is a beautiful IG feed with a bucket load of inspiration for divine table settings for your next picnic or lunch! It’s a Melbourne based collaboration between Stephanie of Stephanie Somebody and Sarah Cooper. 5. @farmerfromdownunder. One for the blokes! But I love this IG feed too. It’s become a document of life on the land from New South Wales farmer Brad Shepard, who has a farm (the is currently flooded) at Lake Nyrang near Forbes. Although the situation is sometimes pretty tough, there is just enough humour injected into these posts and he is fast developing a following for his honest and fascinating commentary. 1. Honest Food; I just love this online food magazine – the only problem is that it’s written in Russian, which I don’t speak – but the pretty pictures are reason enough to have a virtual flick through. And oh my goodness are they ever pretty! The food styling and photography is insanely good and quite unique. Check it out if you are in need of a bit of inspiration! 2. Food tidings; This to me is a wonderful example of the good things the internet can do for us – the basic idea is that if you have a friend of family member going through tough times, perhaps an illness or dealing with grief. Or maybe it’s something overwhelming but happy like a new baby in the family – anyway, you want to take some of the pressure off by dropping off some meals so they don’t have to worry about cooking. But it’s not helpful to have ten lasagne’s delivered to their doorstep on the one day. Food Tidings lets you set up a sort of spreadsheet for a particular person or family and then you invite others to come in and nominate what day they’d like to claim and what they will be cooking and dropping off. You can also order and pay for takeaway in advance (through the website or app) and add that to the schedule. I think food is one of the best ways we can show our love to people in times of stress so this is such a way to do this in a way that’s genuinely helpful. 3. The Flavour Thesaurus; I can’t believe that this book has only just come into my orbit! Such a brilliant idea – it explains in a very straightforward way, why one flavour works with another, pair by pair. So they offer up the more familiar pairings like cucumber and dill, pork and apple – but also some less traditional couplings like lemon & beef, blueberry & mushroom, and watermelon & oyster. 4. Miss Bossy Boots podcast; Jane Hillsdon, who you’ll remember from episode one and who is coming back to hang out with us soon, has been busy launching her own new podcast with Stacey Morgan. It’s all about inspiring women into leadership positions and I just love it. Loads of practical advice on running your own business but also starting out too. And I love where the name came from; Sheryl Sandberg’s famous quote; ‘I want every little girl who is told she is bossy, to be instead be told she has leadership skills’. 5. 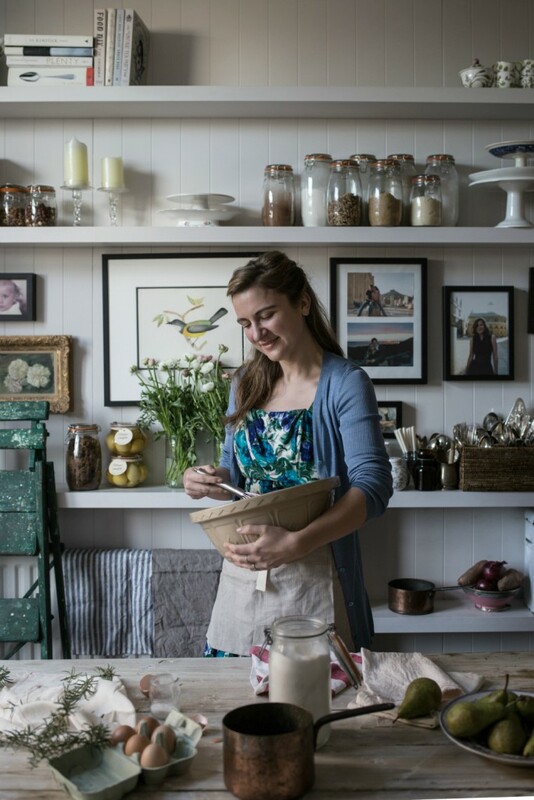 The Life of Clare; All about learning to live simply – Clare’s blog, youtube channel and IG feed is bursting with really practical ideas for a simple, delicious and affordable life – from baking sourdough to keeping chickens and meal planning. She recently wrote about how she feeds her family of three for under $200 a fortnight and the post went viral. Having just spent a few days with Clare at our workshop I love her work even more. A very smart, funny, sweet woman I’m a BIG FAN. And as always, we ended this episode with a song, this week it was; Ode to billy Jo by Orange-based artist Lynda Manwarring, recorded here and produced by our own producer Pat O’Donnell. It’s from her new album The Spring Bird, which you can find here on i-tunes. Thanks and see you in a couple of weeks!